In the two months since my last update on the area they’ve just about wrapped up the exterior construction. The new wall connecting the two buildings looks like it’s been there all the time. And there is a new entrance door in the middle of the wall, just as I was suspecting. It’s nice to see that the Garden of Allah Villas sign has returned after being removed briefly while they did some concrete ground work. They’re not quite finished with some window and door work on the outside, (and who knows how much more they have to do inside the buildings). We’ve known for a while now that this building will house something called the “NBCUniversal Media Lab”, which will probably be a place where employees can use and test new technologies, or allow businesses to use state-of-the-art teleconference technologies. It doesn’t seem, at least at this point, that this will be something that will be open to the public. Learn more about that in my last post on the subject here. See all the new construction update photos below! 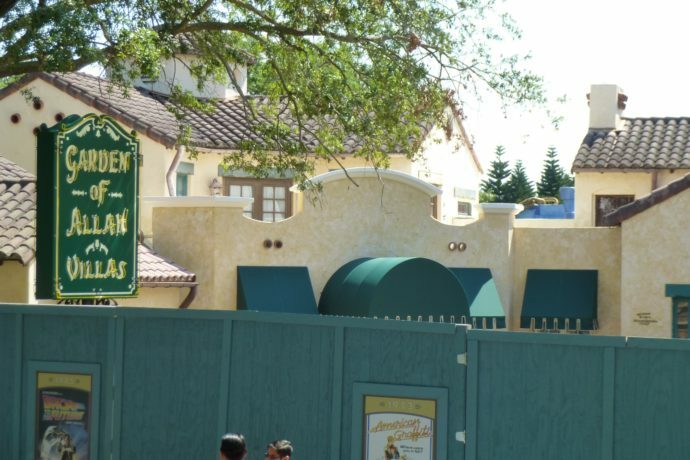 The construction walls are still up. One way to know this isn’t going to be a public attraction is that Universal is not in any hurry to open it! New middle wall with new entrance door, looks great! The new entrance still needs a door. The courtyard has been refreshed and the gyroscope is back in place. The addition onto the back of the building still needs a little work. The corner of the building, still looking incredible, no changes. The old entrance to the building, facing Kids Zone, now completely closed up. View of the backside of the structure, facing Kids Zone Pizza Co. They did a great job adding this middle section that it looks like it’s always been there. I will miss that little shortcut walkway through the Villas though. Woody Woodpecker wants to sell you pizza! That’s all for now! Here’s Curious George and Woody Woodpecker waving goodbye on our way out. That’s all for this update. See the pictures and video from the last update! And learn the history of Garden of Allah area, including what attractions these buildings used to house.